Happy Friday, we continue to showcase our November sponsor, Dreaming Tree. 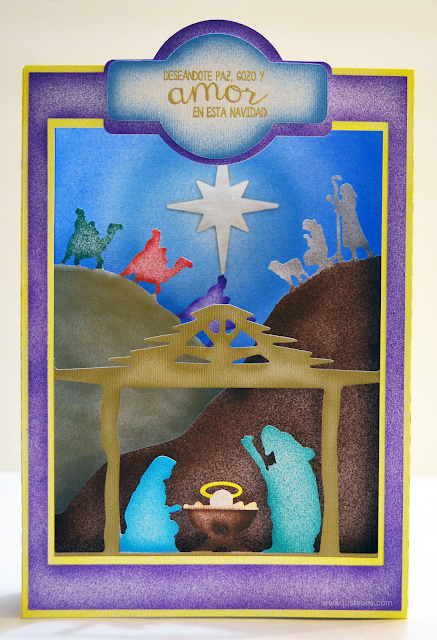 Today, I'm sharing the Nativity Scene from the the Christmas Paperscape Box Cards Collection. The collection has 3 different designs and are available to purchase as single designs. I cut the design on white cardstock with the Cricut Explore and used the eBrush with Sharpies to eBrush. 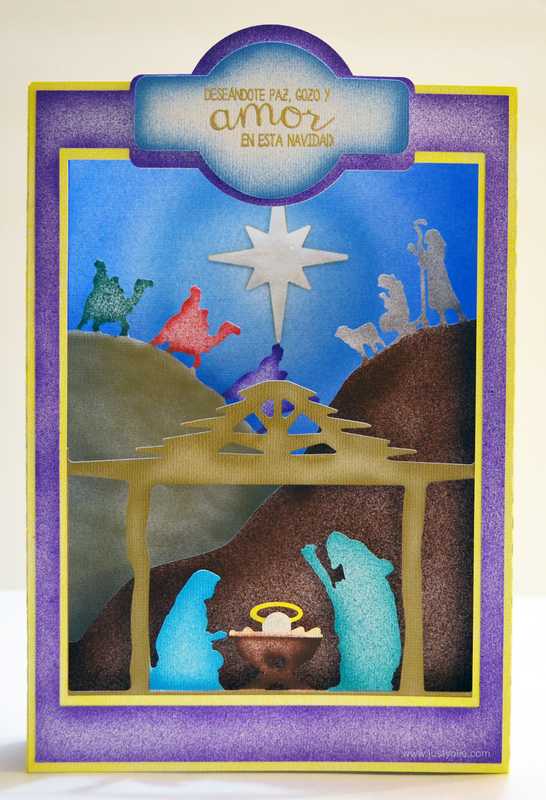 These are 3D cards, however I cut the design larger to use for Christmas decor. Using Sharpies, I eBrushed the background in a circular motion around the North star, alternating between 2 different blue markers. I used the low setting on the eBrush on all the pieces and continued to add the color using washi tape to mask off areas. 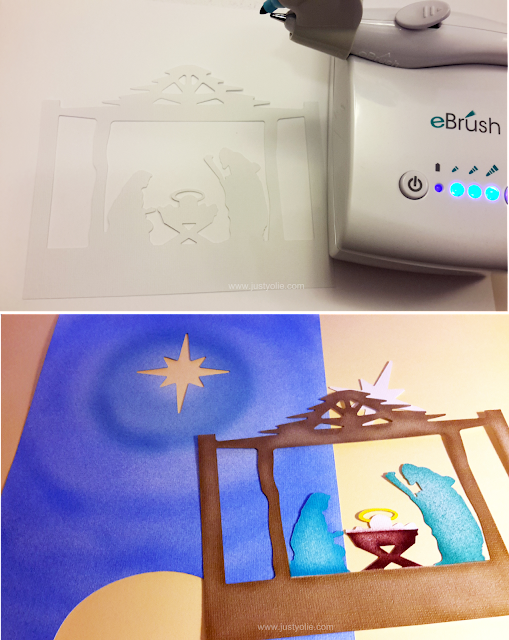 All of the white cardstock was eBrushed with the exception of the North Star and Baby Jesus. I used Latina Crafter's stamp, "Wishing you Peace, Joy and Love this Christmas". I used Gold Shimmer embossing powder and heat embossed the sentiment. 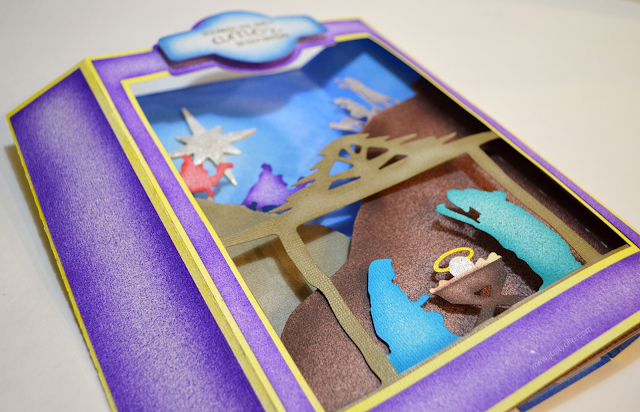 The backside of all of the Paperscape Box Cards have a cutout to allow space for a LED tea light. 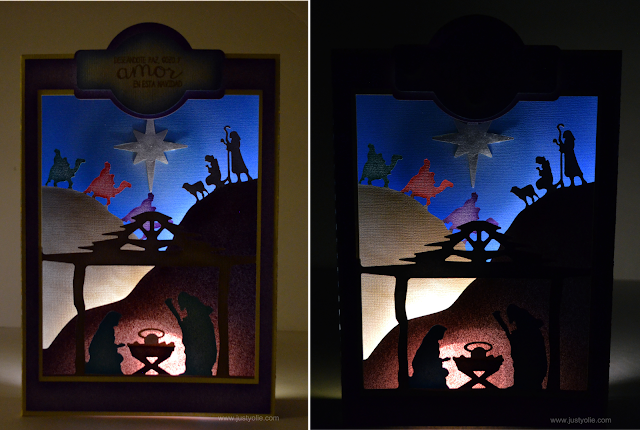 Here is how the Nativity Scene looks like lit. Here is a side view. 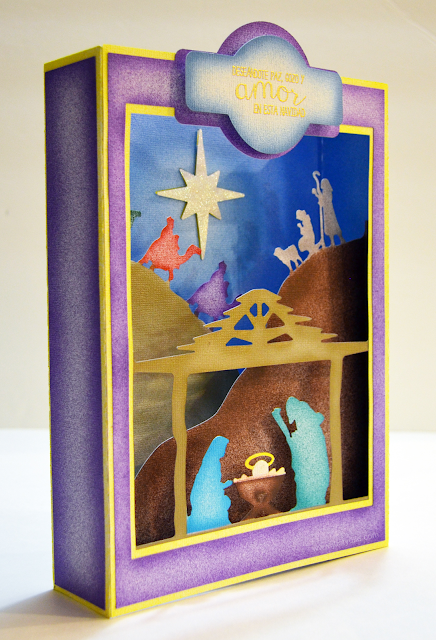 You can see the gold embossed sentiment and the shimmer of the star and Baby Jesus. Dreaming Tree includes detailed PDF assembly instructions and step-by-step video with all of their collections. The Paperscape Box Cards flatten for easy mailing and the SVG for the envelope is included. As mentioned above, I'm using it for Christmas Decor and the my Nativity Scene measures approximately 9"x 6"